Dr. Camp was born and raised in Burlington, Iowa. He received a DDS degree from the University of Iowa, College of Dentistry. Following graduation, he established a dental practice in downtown Burlington. 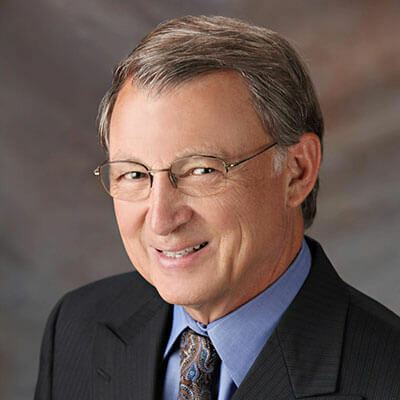 In 1982, he constructed the River Ridge Professional Building and moved his practice to the new dental clinic facility overlooking the Mississippi River. Dr. Camp gets great satisfaction from creating beautiful “restorations” for his patients and is rewarded by their resulting appreciation. He knows that the dental profession has always been held in high regard and he works hard to maintain that level of trust. He has always placed a high value on continuing education and staying up-to-date and is dedicated to serving his patients with excellent care. Dr. Camp was elected as a member of the Academy of General Dentistry. He is a member of the American Dental Association and the Iowa Dental Association. He is Past President of the Southeast Iowa District Dental Society and Past President of the Des Moines County Dental Society. He is also Past President of the Flying Dentists Association, a group of dentists who are pilots that promote aviation safety, dental continuing education and mission dentistry. Dr. Camp participates in the Donated Dental Services program and the Give Kids a Smile program which provides free dental care for patients with serious financial challenges. He also serves as a volunteer Clinical Evaluator for Clinical Research Associates of Provo, Utah, which is one of the nation’s leading dental research and dental education centers. Dr. Camp has worked as a volunteer on many community projects as a member of the Chamber of Commerce and the Burlington Rotary Club where he served as President. Dr. Camp is a licensed instrument pilot and has had the pleasure of giving many youngsters their first experience of flight. Dr. Camp and his wife, Amy, have a daughter and son-in-law, Sarah and Chip Overton, who are both architects in Des Moines. “Papa” and “Nana” Camp enjoy spending time with their grandchildren, Charlie Overton (11), Sammy Overton (9) and Mandy Overton (6). They also have a son, Mike Camp, of Burlington and a deceased son, Charlie Camp. The Camps are members of the First United Methodist Church where Dr. Camp has served for many years as a Trustee and previously served as leader and co-founder of an adult Sunday school class.